I've decided to take the plunge. After months of admiring the trio of bakers from A Year in Bread and reading their blog from start to finish, I thought it might be fun to try and do what they did. A bit of a background first - in March 2007, three bakers - Kevin, Beth and Susan - decided to start baking bread together. The idea was that they will come up with a theme for the month, and all three will do a different recipe matching the theme. Twelve months, twelve kinds of breads - kind of cool, isn't it! For a novice baker like me, it's a crash course in bread baking. And I even get to choose from three different recipes, get three perspectives for every kind of bread there is. They started in March, I start this last day of February. And I might not wait a whole month to try each bread - who knows how many times I fail, and I might have to try two or all three to get where I want to be. So you might see at Bombay Foodie a fast forward of the year that was. Or maybe not; depends on how it goes. Let's start at the start. The first bread they baked was pizza. I don't know who said it, maybe one of them, that baking pizzas before baking a loaf of bread is like baking cookies before you dare try a cake. And for this first dare, I picked Beth. I could have picked Kevin (of the bready pizza recipe, the kind I like) or Susan (of the uncomplicated 3 hour pizza recipe), but Beth's recipe read like a challenge. It's a very wet dough, and it needs to proof for 8 hours and you need to have faith, said Beth. So I put faith in Beth, followed her recipe exactly as I made my pizza dough last night for tonight's dinner. It was wet, and it made me wonder a few times today if I am leaving it in the fridge too long. But the dough seemed perfect when I took it out 30 minutes before I was to bake it. A few minutes later, I also turned my oven to the highest it would go and because I don't own a baking stone, put a heavy baking sheet inside to heat. Beth stretched the dough by hand, but I floured it and rolled it out using a rolling pin. Also kept my pizza sauce (I'd give you the recipe one day, promise! 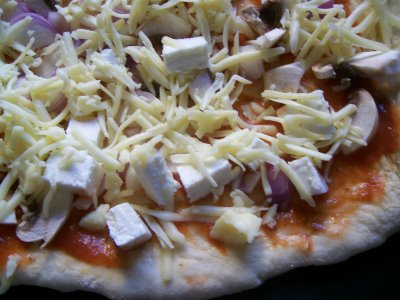 ), toppings (sliced onions, sliced mushrooms and cubed paneer) and grated cheese on the ready. When the rolled out dough had reached room temperature, I brought out the baking sheet and carefully put my pizza base on it. In the next ten seconds, before it had a chance to cool, I spread the sauce, added the toppings, sprinkled grated mozzarella and some salt & pepper to finish my pizza and put it in the oven. I left my oven at very, very hot and the pizza took around 10 minutes to brown. And it was perfect! So hear you all, I finally made pizza and it wasn't hard and it wasn't chewy and I loved it. I have the other half of dough still in the freezer. Pizza for breakfast, maybe. Congratulations on your delicious pizza success! We love that you're going to bake your way through A Year in Bread and are looking forward to hearing about more of your efforts. Happy baking! Love it Simran.Love the way you chose a challenging recipe.Thanks for the tip of using a baking sheet.I too do not have a pizza stone.i too would have rolled the dough rather than stretching by hand. Hey am most impressed with all the cooking you do.. am more of a 'one day this is something i will try' gal.. and fellow aquarian.. yes am Bombay based! ...and another one bites the dust! Looking forward to your endeavors! The pizza turned out great. baking is addictive,..:-)hvent tried pizza base t home,.but i guess i will try now,..
Hi,just saw your adorable pecan pudding at Jayasree's blog and came here..
Making pizza base is a big challenge to me..Now Im gonna try Beth' recipe ..Thanks for inspiring me..
hi Simran, Are you from Madras, If so, can I have your email id as I will be visiting Madras soon, and would like to have your advice ..